Pabu’s human thought you should see her at her best. Pretty girl. This entry was posted in image of dog, Uncategorized and tagged Dogs, image of dog, Pabu on November 8, 2017 by lifelessons. This is my friends Allenda and Tony’s darling dog Pabu. Limiting colors to black and white does not alter him at all. Click on photos to enlarge. The prompt this week is pets. This entry was posted in Cee's black and white photo challenge, dogs, image of dog, Pets, Uncategorized and tagged Cee's black and white photo challenge, dog photos, Dogs, images of dogs, pets on November 7, 2017 by lifelessons. because still waters might run deep. rash actions trip up the infirm. if you aren’t a go-getter. you’re up against the proverbial wall. It’s best you do nothing at all! The boy knows how to make himself comfortable. This entry was posted in dogs, image of dog, images of dogs, Morrie, photos of dogs, Uncategorized and tagged Daily Post, Daily Prompt, Dog images, dog photos, Dogs, funny poem, Good dogs, humorous poetry, Morrie, Morrie images, poem about couch potatoes on March 1, 2017 by lifelessons. Morrie on “his” porch. We all pass at our own risk. Morrie on his way home from visiting neighbors. Lovely flora of Morrie’s own personal relief station. She said WHAT about me???? Morrie and his “homies” Rachel and Justin. Rachel left yesterday and Justin today. It is rumored that new homies moved in upstairs later on today. Morrie is finding it nice to be the biggest upon occasion. But this little guy didn’t know Morrie was the biggest! Morrie on his sleeping porch. He also has a sleeping sala, a sleeping dining room and a sleeping couch. My mom got a man on the beach to make me this collar with my name and her phone number on it, so I guess any escape will be short-lived. This entry was posted in dogs, image of dog and tagged Morrie, Morrie at the Beach, Morrie images on January 15, 2017 by lifelessons. Personally, I prefer last year’s model. This year’s looks too grown up. But it will be good for the beach. He looks like a square-jawed rabbit, doesn’t he? Today’s prompt word was year. This entry was posted in dogs, image of dog, photos of dogs, Uncategorized and tagged Dogs, images of dogs, Morrie, Morrie images on January 1, 2017 by lifelessons. I’ve been working sunup to late afternoon for the last four days setting up and running a booth that sells the wares of all of the participants of our wonderful Maestros del Arte show in Chapala. The last two days were rainy and cold which necessitated two revampings of the booth and moving of all the goods. The rain kept coming and the mud puddles got deeper. I was running from booth to booth and then back to ours and came home exhausted every night. Tonight, therefore, I got home at 5, fed the dogs, warmed up a few leftovers, washed off my muddy feet and fell into bed. It was freezing cold in my house with no central heating, so I set a little space heater on my night table and took turns warming my four sides of my body, fetched a heating pad to warm my hands, and socks to warm my feet. I fell asleep at 7 p.m. and woke up at 11 p.m. Still, still night. Went out to see the Super Moon, but it was too overcast to reveal even a glow to suggest where it might be. Then the gloom opened up for a few seconds and I ran in to get my camera, but by the time I located it, the sky had closed its window again. Read a few blogs, including Murdo Girl’s which had a video I turned on. In it her three dogs were barking and barking. Immediately, Morrie and Diego, who had been sleeping peacefully in the doggie domain, went rushing out into the night to bark back at them outside the sliding glass door to my bedroom. Then all the neighborhood dogs began to bark back. 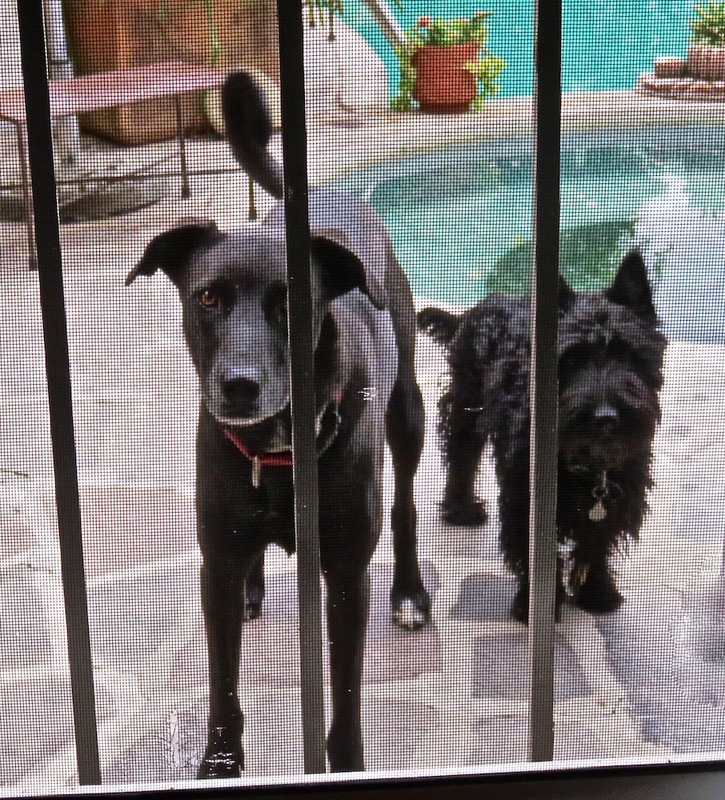 I brought my dogs in with the promise of a dog biscuit, locked them in their cages, and they are calm once again, but sixteen minutes later, the neighbor’s dog is still going crazy. The dangers of blogging. This entry was posted in dogs, image of dog, misbehaving dogs, Stories about dogs, Uncategorized and tagged dangers of blogging, Dog images, dog stories, Dogs on November 14, 2016 by lifelessons. Two big problems were solved for me today with the construction of two circles. First of all, the lovely installation created by Leonardo in my garage was removed today and reconstructed in a better spot so the garage is free again to park my car and load it up with supplies for my two month stay at the beach. 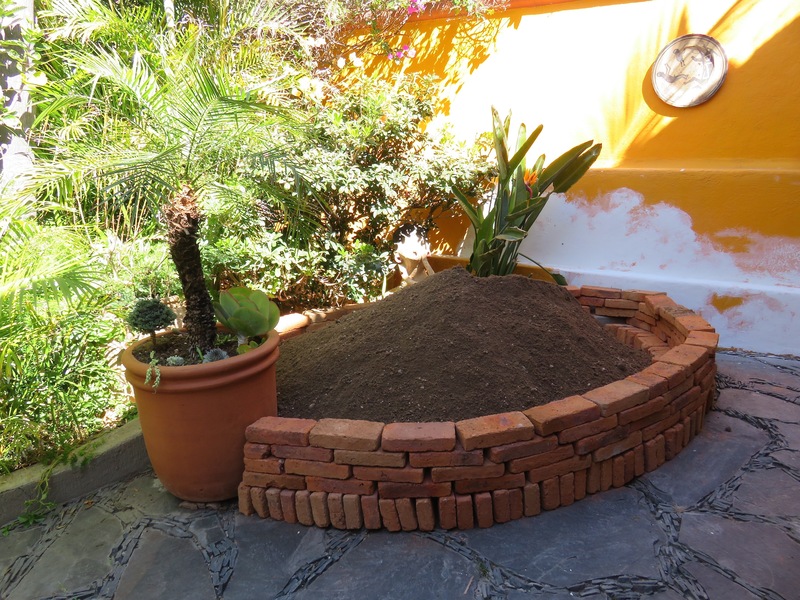 Eduardo, an artist friend who is also Leonardo’s father, is here for the next 6 weeks to build flower boxes around my flower plots in the garden, to build a brick sidewalk leading down to the pump for my irrigation system and to repair salitre damage and paint my house. We have negotiated the terms and most of this work will go on while I am gone. Here, then, is my first new circle. It is just to hold the sand for construction, but I’m fond of it already. perhaps a little pond here later? No, probably not. I love how he incorporated the flower pot into the design! Actually, a semicircle now, but we will imagine the other half of it, for purposes of maintaining my theme! 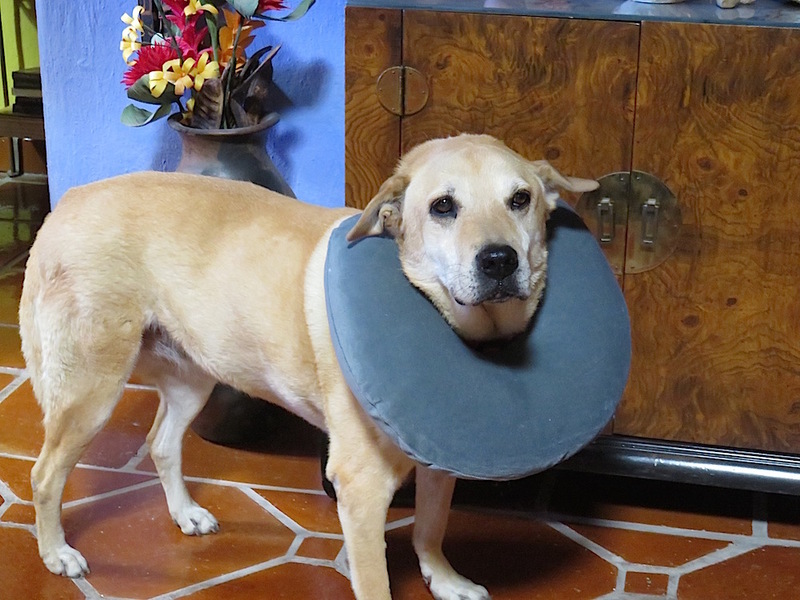 So, with one problem solved, I set about trying to figure out how to keep Frida from licking her “hot spot” wound. The neck cone definitely didn’t work. She was a crazy woman for the one night after I put it on her and that made me a crazy woman. Also, although she’s taking a course of antibiotics, they will do no good if she keeps licking the wound and reinfecting it and also it does no good to put Neosporin or other medicine on it because she licks it off. So, what to do? We will see how Frida’s new “necklace” looks after being outside for a day. So that, my friends is how I resolved my two biggest problems and how circles came to save the day!! This entry was posted in image of dog and tagged Dog collar, Frida, Frida images, Garden installation, Inventions, Leonardo, Two Circles on January 12, 2016 by lifelessons.